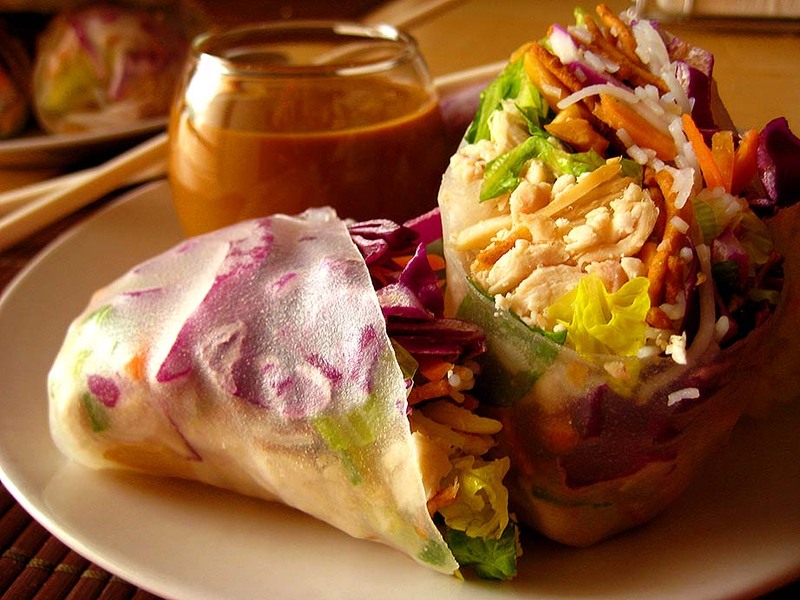 I love the combination of bright, fresh, crunchy vegetables, mint leaves, crunchy peanuts and flavorful chicken all wrapped up in rice paper wrappings. It’s healthy summer eating at it’s most effortless — you don’t even have to turn on the stove! 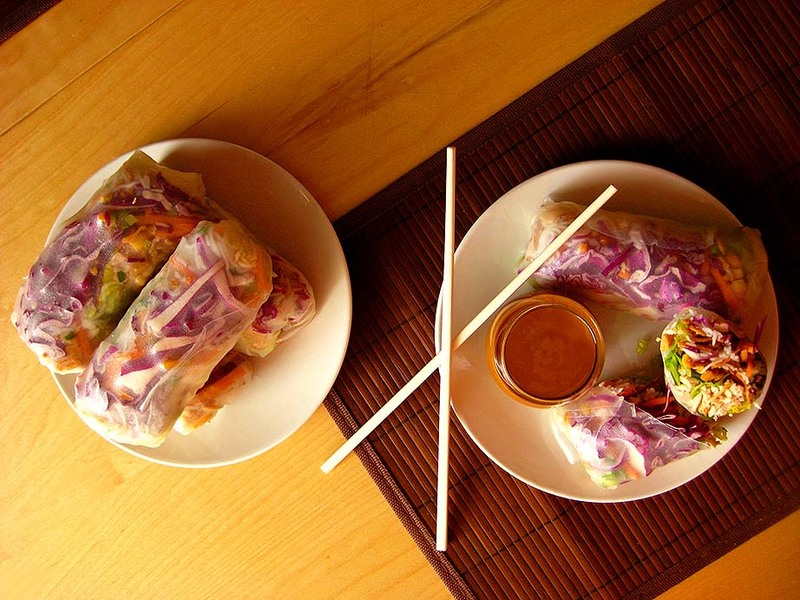 — and you can make a whole ton of these summer rolls in one shot. Also, they’re easily made vegetarian or vegan by replacing the chicken with more vegetables or by subbing some good baked tofu for the chicken. It’s a good way to still get your protein! The transparent wrappers will showcase the vegetables in all their colorful glory, so make sure to pack them with a gorgeous rainbow of veggies. These rolls are made even easier with the addition of storebought rotisserie chicken. 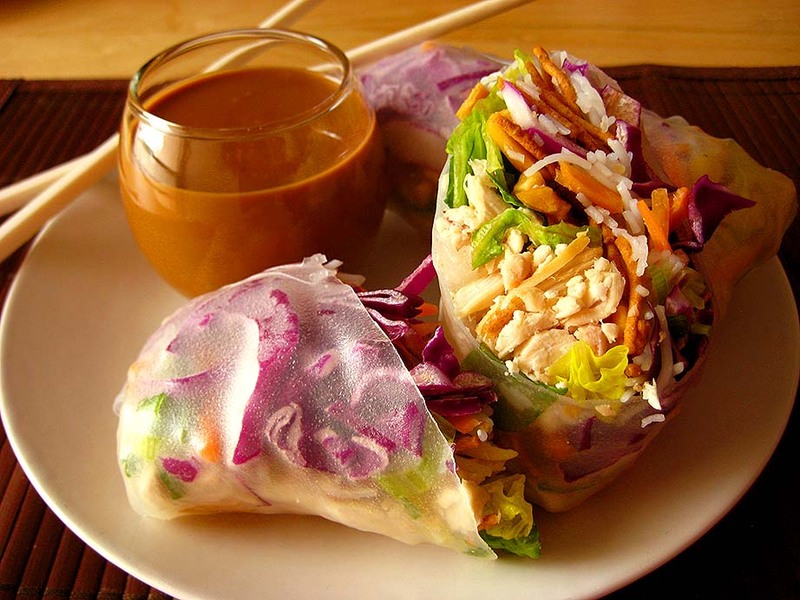 It eliminates the step of having to roast your own chicken, which saves time and means that you can enjoy these fresh summer rolls in a short amount of time. The vegetables aren’t measured precisely, just add as much or as little as you’d like! 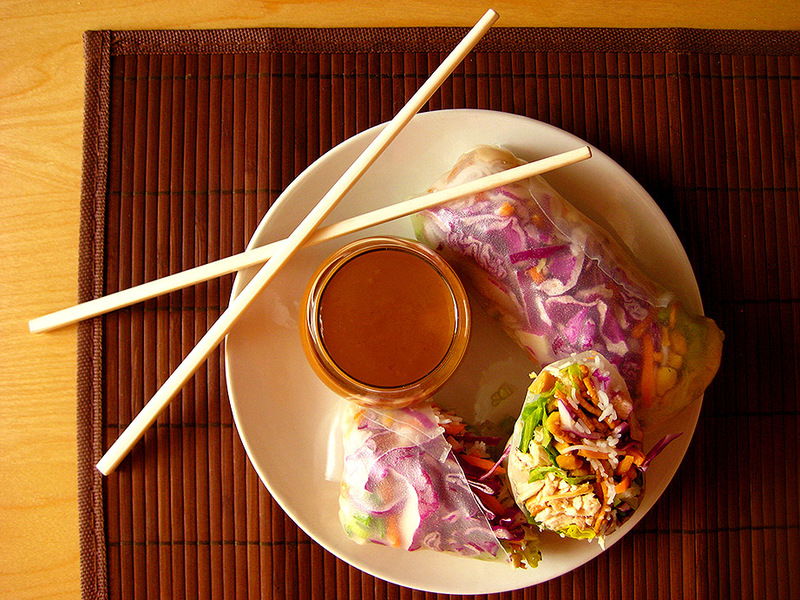 The hoisin-peanut sauce is an interesting savory and slightly sweet dipping sauce that complements the rolls perfectly. **I didn’t take any prep photos as I went, but there are plenty of finished photos for reference! Start by setting out all your chopped and prepared summer roll ingredients so they’re within reach. Grab a cake pan (10 inch is perfect) or a large baking dish and fill it partway with warm water. Soak two rice paper wrappers in the water at a time, turning over to make sure they’re softened on both sides. This shouldn’t take more than 20-30 seconds, you still want to be able to feel a slight bit of the textured pattern they’re imprinted with, and they’ll continue softening once they’re removed from the water. Gently remove the wrappers from the water and lay them on top of each other on a large plate or your clean counter top. Smooth the wrappers so they don’t have any wrinkles, and place some purple cabbage shreds down first, followed by some shredded carrot, minced green onions, mint leaves, soft rice noodles, crunchy rice noodles (if using), chopped peanuts, lettuce, and your chopped chicken (or tofu, if you’re going the non-meat route). Now it’s time to roll! Starting from the top edge, pull the wrapper over the filling so that it overlaps the filling almost to the center, and then do the same with the bottom half of the wrapper. Carefully pull the right side of the wrapper over the filling, pressing it on the folded top and bottom edges to seal, while pulling and rolling the right side of the wrapper so that it meets the edge of the filling on the left side. Tuck any stray bits of filling back under the edge of the wrapper, and continue rolling the wrapper toward the left, pressing down and pulling back toward the right at the same time to ensure a tightly wrapped roll. Continue rolling all the way over to the left side of the wrapper, completely rolling the finished roll to the left so that the left edge of the wrapper seals itself to the rest of the roll. Repeat, filling as many rolls as your fillings will allow. For a whole rotisserie chicken, I got about 11 rolls, some in varying sizes. It took me a bit to find my rolling groove, and don’t get discouraged if you don’t roll them so pretty at first. Practice makes perfect! 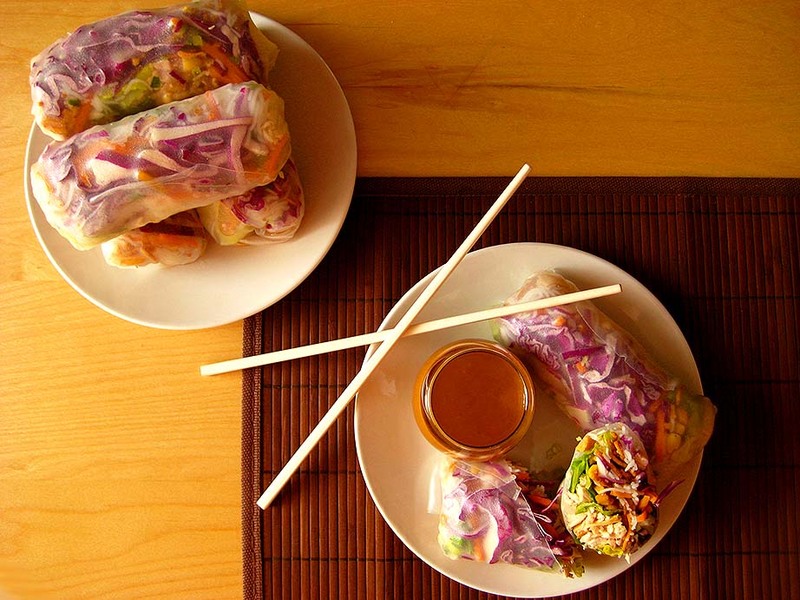 These summer rolls are best when eaten immediately, but if you have extras, they’ll keep for a few days in the fridge if packed in a plastic container that has been lined with damp paper towels. 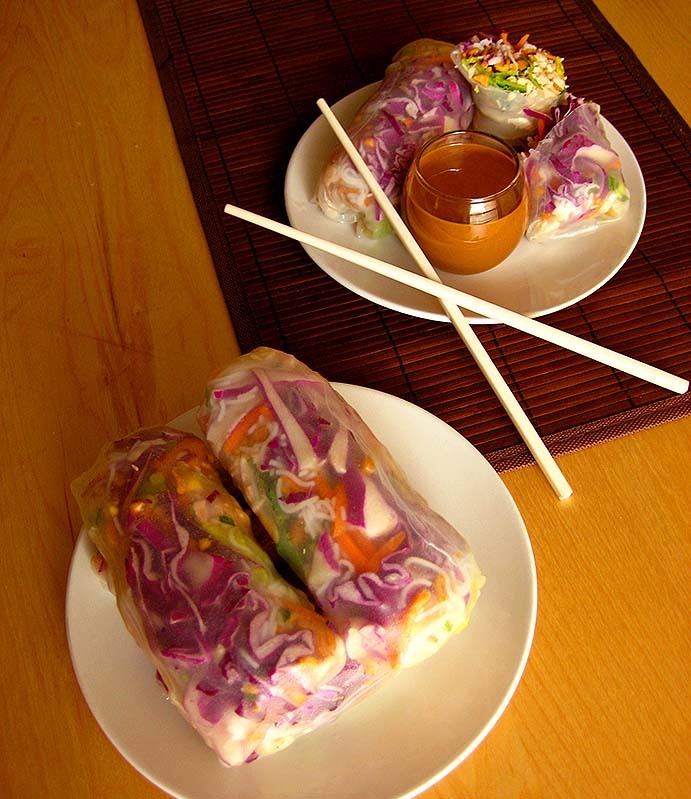 Be sure to cover the rolls with damp paper towels as well, cause the rice paper wrappers will dry out very easily. To make the sauce: In a bowl, stir together everything except the warm water. Once everything is combined, stir in the water until the sauce is smooth. Add more or less water depending on how thick or thin you want your sauce. I found that 8 tablespoons of water was the perfect amount to create a smooth sauce that wasn’t too runny or overly thick. These rolls are wonderful when the summer heat starts creeping up. Crisp and cool and refreshing, they are not heavy in the slightest, and they’re just the thing for a light and healthy lunch, dinner or snack. Previous Previous post: there’s always money in the banana stand.